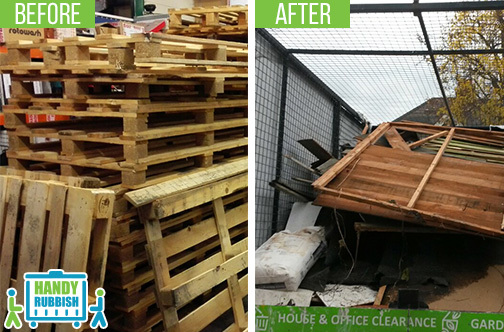 Don't even think about tackling with any NW2 rubbish clearance work on your own when you can hire our company and our trained employees to do it for you. If you think it's going to cost a lot of money, it isn't so because we pride ourselves on having some of the lowest prices around. That makes it affordable to do a complete house clearance no matter if you want a partial clearance done in any other property. This includes Cricklewood waste removal NW2 which we do on a daily basis on behalf of many different companies. Whether the reason is - doing some decluttering in your home or tidying up your garden and doing waste clearance Cricklewood or whatever other reason you may hire us and you can be sure we won't let you down. We will always do the job to the highest standards. Our experience means we have an expertise that is very difficult to find elsewhere and considering our prices are so low, there's every reason to call Handy Rubbish on 020 3540 8282 now. There are many ways Handy Rubbish can save you money providing the best services at the lowest prices you'll find anywhere. You won’t need to spend means on things such as skip hire because our employees come with a truck to take everything away. You will also find our company pleasant to deal with because we have helpful staff who are considerate and polite. When you need Cricklewood rubbish removal done or some kind of waste disposal NW2 carried out, you can depend on us every time to do the best job. We understand that each job we carry out is unique. That's why we take into consideration your unique requirements, so you're getting a tailor-made service which, we feel, shows in the finished result. So if you have domestic or commercial NW2 rubbish disposal you would like carried out then get in touch with our company and you will also be sure that there's a clearance firm who won't let you down every time you need help. Call 020 3540 8282 now because our waste collection specialists in Cricklewood would love to hear from you and inform you how low our prices are. The crew arrived on time, 9 am out here in NW2, bright and bushy tailed, and carted off some terrible rubbish. Best builders waste removal company I've ever had the pleasure of doing business with. Would recommend their rubbish disposal service in Cricklewood NW2! The service was great and cheap too. Cricklewood is an area of north London that stretches out on either side of Cricklewood Broadway and Cricklewood Lane. In between the London boroughs of Brent, Camden and Barnet, it has many leisure, education and business facilities. The area was once just a small settlement around Watling Street (now Edgware Road) before the railway and underground railway arrived in the 1870's. Today, it has mostly Edwardian, late-Victorian and 1930's architecture with some other impressive buildings such as the one presently housing the Crown Moran Hotel, once the Crown pub. Cricklewood has excellent transport links with Cricklewood mainline train station linked to St Pancras International, Farringdon Station and Luton Airport. Willesden Green tube station on Walm Lane is on the Jubilee Line as is Kilburn Station also about 15 minutes away from Cricklewood Broadway. Cricklewood Broadway is part of Edgware Road and runs down to Marble Arch between Hyde Park and Oxford Street. A notable and popular green space is Gladstone Park, which, in addition, has sport facilities, an art gallery, cafe and pond. 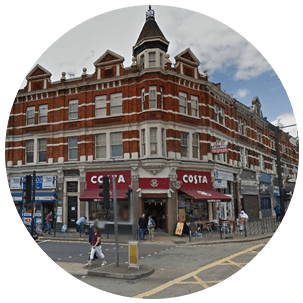 Areas around Cricklewood include Brondesbury, West Hampstead, Kilburn, Dollis Hill, Willesden Green and Childs Hill. Cricklewood is covered by the postcode area NW2 with other nearby postcodes including NW6, NW10, NW9 and NW4.